The church was erected about 1180. The original church was a large cruciform building without aisles. The mouldings on the tower arch and the west door, as well as the door itself, are fine examples of this late Norman work. The font is also Norman, but rather plainer. Remnants of the original Norman buttresses and clerestory can be seen high up in the north and south aisles, and also on the exterior. The door on the tower staircase dates from the foundation of the church, and might possibly indicate the presence of a monastic quire and explain the length of the chancel – the church may have been intended as a small priory of Abingdon Abbey. The door is probably too early for a rood screen. Soon after the establishment of the vicarage the aisles were built, probably by punching through the original walls as at nearby Dorchester Abbey. The porches, as well as the lancets in the south and west walls, probably date from this period. In about 1350 the low aisles roofs were raised, evidence for which is still clearly visible on the exterior west wall. Traces of medieval painting can be seen in the blocked Norman doorway of the north transept (behind the organ). The chancel was repaired in the late fourteenth century, and there were elaborate plans for rebuilding the chancel following the Lincoln diocesan visitation of 1520. It is likely that aisles were planned on each side to be entered through the Norman blank arches in the transepts. The Reformation halted work and the chancel was left without windows on both north and south walls. Windows were added first in the early seventeenth century and more substantial windows in the first Victorian restoration. After the dissolution of the monasteries the church quickly decayed, but was restored in the early 1600s, shortly before the construction of the palace. Many of the pews date from 1630 – they were constructed only after a long dispute between the vicar and the parishioners from Wheatley. A simple wooden screen was erected against the tower arch which was removed in the Victorian restoration. Bishop Bancroft also had a new straight-headed window put in the south transept, which was later replaced. He was buried under the south wall in 1640. A small room was added next to the tower staircase in the late 1820s which explains the small window at the east end of the north aisle. The room was soon dismantled. In 1849 the chancel was extensively restored by Benjamin Ferrey. He removed the memorial tablets to the south transept, dismantled the lathe and plaster ceiling and added memorial windows to the bishops of Oxford, together with the rather oversized woodwork. The chancel gained the appearance (which it still has) of the bishop’s private chapel. Brasses and enamels were given in memory of the bishops of Oxford from Stubbs to Strong (d. 1944). G. E. Street, the diocesan architect, who shortly afterwards built the college, carried out a second wave of restoration from 1851-3, replacing the wooden ringing chamber with the groined vault in the crossing. Street also added a hideous stone pulpit, which was soon removed. The present pulpit was carved by Bishop Stubbs’ daughter, Katherine, in 1895 to a design by C. E. Kempe. A new gothic altar was built by Street which has since been modified twice in accordance with the latest ecclesiastical fashion. The riddle posts were added by F. G. Howard in 1921, and it was lengthened in 1933 to designs by H. S. Rogers. In 1931 the south transept was partially converted into a Lady Chapel in memory of Principal Ducat. Later in the 1930s Eric Graham, a particularly high-church vicar, sought an ambitious re-ordering of the church. Plans were made by Stephen Dykes-Bower to build wrought iron screens and gates around the crossing and to erect an altar in memory of John Russell, a vice-principal of the College. Fortunately only the gates to the chancel were constructed by 1941 when work stopped because of the war. An aumbry for the reservation of the Blessed Sacrament was also constructed at the same time. Plans for an elaborate organ gallery at the west end were also made by Dykes-Bower, but never carried out. After a succession of electric organs the current pipe instrument made by Henry Willis was bought from Christ Church cathedral in 1982. It was originally construc ted for St Margaret’s Convent at East Grinstead. A hatchment that has hung neglected in the ringing chamber of the tower of All Saints has recently been restored and now hangs resplendently in the nave over the north door, a particularly appropriate position because this was the door through which Bishops of Oxford, resident in the Palace just to the north of the church from the seventeenth century through to the 1970s, would have entered All Saints. 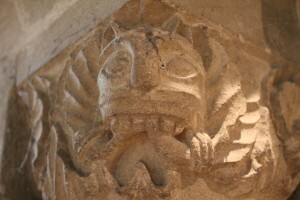 You cannot help but see the hatchment ahead of you as you come into the church from the south porch. Hatchments are huge diamond-shaped paintings of coats of arms (this one is nearly seven feet high when hung) and it was the custom for them to be produced on the death of someone entitled to a coat of arms. They date from the end of the seventeenth century and it is not at all certain how hatchments (the word is a corruption of ‘achievement’) were used. Some heraldry experts think they were carried in procession during a funeral and then hung in the church until the tomb of the deceased had been constructed. 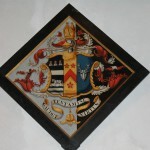 But, by the time our hatchment was painted in 1827, it would have simply hung on the outside of the house of the deceased, above the front door, during the mourning period and would then be deposited in the local church. We can interpret this painting by noticing first how the central shield is split into three parts, each with a different coat of arms. On the right is the Legge family arms, a silver stag’s head on a blue background; in the centre is the arms of All Souls College, three rosettes and a chevron on a gilded background; and on the left is the arms of the see of Oxford, with the ox crossing a ford below and three female saints above, on a dark blue background. The heraldic shield of a bishop is normally shown with a mitre over it but here we have the very unusual arrangement of a nobleman’s helmet over the shield with a bishop’s mitre over that. Below the shield is a swirling ribbon bearing the Legge family motto: gaudet tentamine virtus (virtue exults in the trial). Finally, notice how the background is painted so that Edward Legge’s arms are on a black background, because it is he who has died, but the arms of the college and the diocese are on a white background. 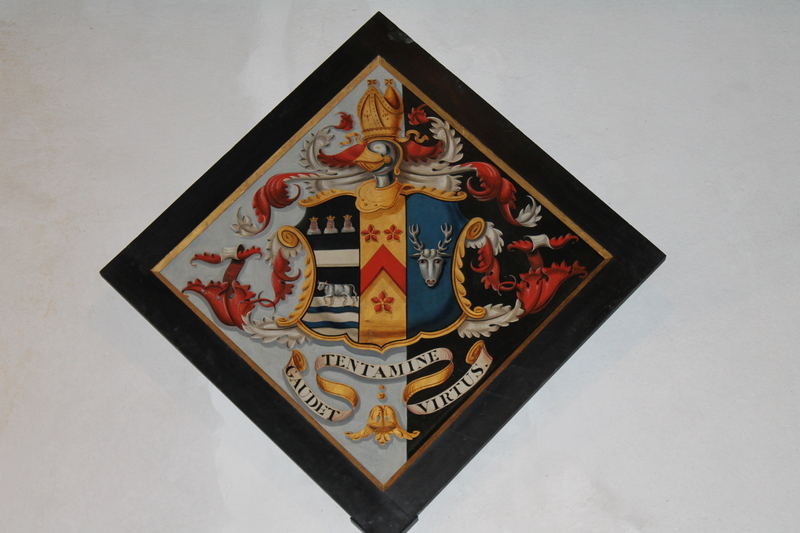 Our hatchment has been very beautifully restored and for that we must thank Richard Knight, who used to live next to the church in Wall House. An expert in art history and in charge of Old Masters for Christie’s, he steered the restoration process, arranging for the painting to be taken from its frame in the tower and carefully wrapped around a cardboard cylinder by the specialist who then re-backed the canvas prior to restoration of the oil paintwork and of the frame. Thanks too to Joe Gleed and Paul Sellar, who together managed the difficult task of hanging the hatchment; also to John Paxton for a very generous donation and to All Souls College, who also kindly contributed to the cost of restoration. The PCC has underwritten the remaining cost but if you would care to make a donation and be mentioned in the permanent information notice that will go on the wall below the hatchment, please contact me or any other member of the PCC. Since the foundation of the theological college by Bishop Samuel Wilberforce in 1854 (now Ripon College Cuddesdon), All Saints’ Church has been known throughout the Anglican Communion. It is still used for evening worship during term time throughout the year. The village of Cuddesdon has always had a close association with the Church. Soon after the granting of the charter in 956 AD, the estate, which also included Wheatley, became an important source of revenue for the monks of Abingdon Abbey, who retained the land until the dissolution of the monasteries in Henry VIII’s time. The Abbey, which was one of the richest in the country, was responsible for building the first church on this site, which was mentioned in the will of Abbot Faritius in 1117. After a long legal dispute, the Abbey gained the rectory (i.e. the bulk of the ecclesiastical revenues) of Cuddesdon in 1237 and appointed vicars to minister in the parish. After the Reformation the advowson (the right to present vicars) was held by a number of private individuals, but in 1589 it was transferred to the bishops of Oxford, who were also granted the rectory as part of their endowment. Since the bishops had no house, Archbishop Laud suggested that Cuddesdon might be a suitable site, given that the bishops already owned the land, and it was on a hill away from the somewhat unsanitary conditions of Oxford. In 1632, partly to increase his revenues, Bishop John Bancroft appointed himself vicar of Cuddesdon, and shortly afterwards built the first palace to the north of the churchyard. In 1637 the vicarage was permanently appropriated by the bishops of Oxford. Ministry was exercised by a number of chaplains and curates. From the eighteenth century there was a separate curate for Wheatley and a new chapel of ease was built in 1793. Wheatley became a separate ecclesiastical parish in 1855. The bishop’s palace was burnt down in 1644 to prevent its use as a parliamentary garrison. It was not until the time of Bishop John Fell that a new palace was completed in 1679, and from that time until fairly recently most of the bishops of Oxford have lived in Cuddesdon. Samuel Wilberforce considerably expanded the palace in 1846, and his chapel still survives. After a period of neglect the palace was burnt down again in 1958 and a new more modest house completed in 1962. It passed into private hands in 1977. (1) SOUTH PORCH, CHANCEL, TOILET: the first three months of the year were dominated by the completion of the Heritage Lottery funded restoration. During this period, we continued to hold all services in the Edward King Chapel at the kind invitation of the Sisters and of Bishop Humphrey. Our first service back in the church was on Easter Day, 16th April. 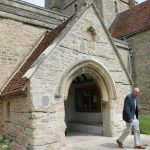 A detailed account of the obtaining of a £200,000 grant from Heritage Lottery and of the work involved in restoring the chancel and south porch and in installing the toilet and store cupboard in the north transept was included in the PCC Report for 2016. Although work had begun in September 2016, much still remained to be done at the start of 2017. 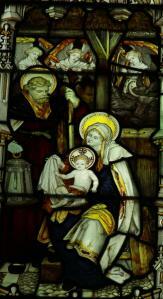 The chancel windows were returned in mid-January, sparkling after their re-leading and cleaning. 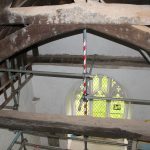 Asbestos guttering and rain-water pipes on the north side of the chancel were replaced with cast-iron goods and the drainage ditches and soak-aways around the church were cleared as far as possible and made good. New foundations were laid for the floor of the chancel and the tiling completed. 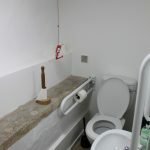 The toilet was connected to the sewer system near the lych gate and water piped into the toilet and store room in the north transept from the existing water supply in the churchyard and using previously laid piping. Final pointing of the south porch could not take place until early May, after an issue over the too shallow insertion of stabilising rods had been resolved. Site meetings continued at monthly intervals until the ‘snagging meeting’ in May and the Practical Completion Certificate was issued on 9th June, after which application was made for the final 10% of the grant. 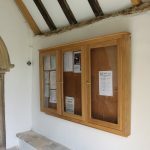 We should also add some mention of the handsome book case for guidebooks and postcards with its integral donations box, which was fixed to the north wall of the nave to the left of the north door and of the fine new set of glazed noticeboards installed in the south porch. 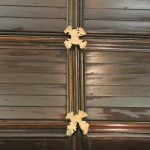 That work was carried out by Darren Wells of Furniture and Design Ltd. who had some years previously made the cupboards and drawers in the south transept. The production of a guide book enabled us to work towards fulfilling a condition of all Heritage Lottery grants which is that the recipients make the heritage more available to visitors and wider communities. Robert Wilson compiled the guide book which was skilfully designed by Therese Luke and which includes an introduction from Emma and a concluding essay on the history of church and parish by Mark Chapman. Ben Hawley was commissioned to take photographs and an excellent spin-off from his work was a set of postcards. Detailed assessments of the whole restoration project were carried out by our independent assessor, Roger Boswell, and the requisite final report and summary of all we had learned from the experience of managing the project was expertly crafted by Keith Hawley. The guide book and postcards are available without charge to visitors, who are merely invited to offer donations. The lettering on the bookcase was managed by Robert and Emma subsequently placed welcome notices on the south door and inside the church. A celebration of the restoration took place after Benefice Communion on 4th June, when Susan Palmer again managed excellent refreshments. (2) CENTRAL HEATING: an unfortunate result of the restoration upheaval and possibly of the placing of scaffolding outside the north transept, was that the central boiler failed. Richard Palmer carried out a thorough investigation of alternative replacement boilers and a new boiler was finally installed in the autumn with subsequent fitting of a new programmer. (3) BELLS: Details of the expert fundraising and discussions managed by Keith Hawley and Waveney Luke, with the Whitechapel Foundry and subsequently with Whites of Appleton and of the lengthy negotiations with the DAC towards obtaining a faculty for the restoration of the bells were outlined in last year’s report but, at the time of writing this report, the bells are still out of the church and work remains to be done in securing the floor of the clock chamber and in reinforcing the bell frame prior to their return. We had been advised that the treble bell was porous and must be replaced and early in the year (22nd March), a small group of us visited the Whitechapel Foundry and saw our new treble bell being cast. Details of its dedication in memory of Dr Christopher Ware, were included in last year’s report. It was an historic moment; this was the last day on which Whitechapel were casting tower bells before closure of this long-established foundry. 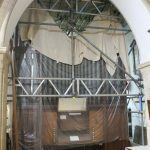 Scaffolders moved into the church on 2nd October 2017 to cover the organ and make possible the opening up of the historic route for removal and return of bells. 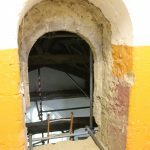 A week later, Rayners of Abingdon, our regular contractors, removed the walling under the access arch between the ringing chamber and high in the wall of the north transept. 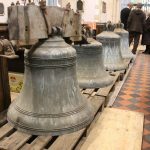 Five of the bells were successfully brought down and placed in the central aisle of the nave and we enjoyed a viewing which was open to the village during the evening of the 18th October. 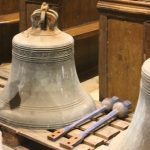 However, the largest bell, the tenor, could not be brought through the passage between north transept and north aisle of the nave and an adjustment to our faculty was needed to enable Whites to remove the canons (the cast-in staples from which the bell hangs). This was not a disaster; indeed, some advisers had recommended it. However, the bell was then found to have hair cracks in its neck and a further adjustment to the faculty was needed to enable Whites to send the bell away for welding. Another complication emerged a few weeks later when close examination of the central ceiling beam of the ringing chamber convinced us that it was unsafe. 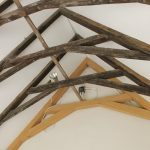 A meeting with Robert Montgomery and subsequent report from William Morris, of Solid Structures (UK) Ltd., confirmed the need for replacement of the beam and a further adjustment to our faculty was needed. 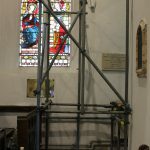 At the time of writing this report, the faculty has been issued, scaffolding is in the ringing chamber and Rayners are about to replace the beam. We have a few weeks to go before the bells will be returned to the tower. 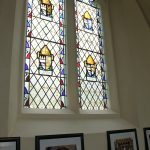 (3) WEST WINDOW: an important letter from Philip Bobby, formerly a long-serving member of the PCC and architect in charge of a range of restorative projects, informed us, inter alia, that the west window had been re-leaded in the late 1970s by Alfred Fisher, lead-worker and glazier from Harpenden. 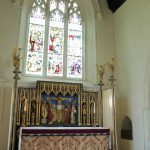 The intention of carrying out work on the window was, therefore, deferred and grants received towards its refurbishment can, in due course, be directed towards re-leading and restoration of the two lancet windows at the west ends of the aisles. (4) CHURCHYARD and FLOWERS: Messrs Gordon and Colin Dimmock continue to maintain the churchyard to a very high standard and we are grateful to the Parish Council for their grant of £500 towards the overall cost of around £1,800 for keeping the churchyard in good order. In addition to grass cutting, some important pruning of ivy on walls has taken place and a barrier created in the north east corner to deter the ingress of badgers. Jean Mackintosh and other ladies continue to decorate the church most beautifully for our usual services and especially for festivals (though, of course, this was interrupted during the time when we were unable to hold services in the church) and we are very grateful to them.